Few weeks before we go to KL, we already bought the Aeroline bus ticket for back and forth. The service of the Aeroline bus was the best if compare to other bus companies, and of course, the price was expensive as well which is RM120 for back and forth heh. 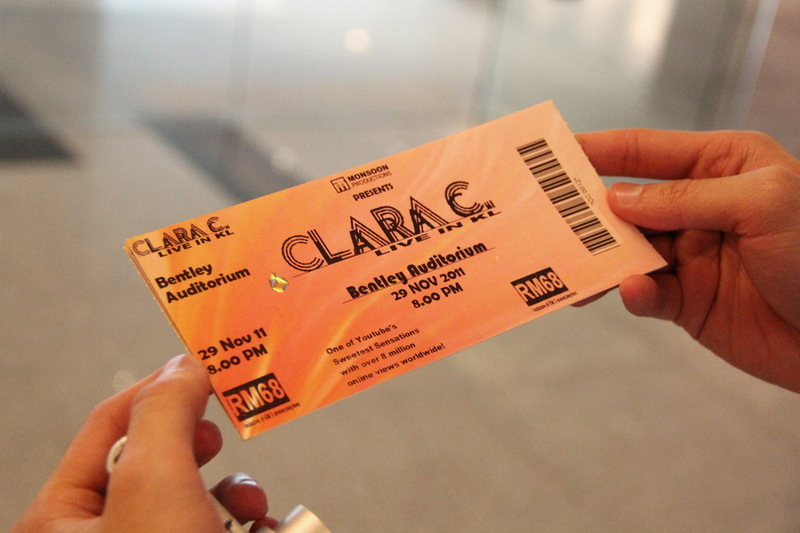 When the date is coming, all of us are so excited because on that night we will attend Clara's concert already hah! The bus stopped at 1 Utama around 1.30pm. Before we go back to Alvin's cousin apartment for some rest, we plan to shop and eat our lunch at there 1st. After we rest for around 2 hours in Alvin's cousin apartment, we sit the taxi to Bentley Auditorium to redeem our tickets hoho! Every of us were busy to take pictures with the tickets and poster 1st LOL! Due to the time still early, we went to IKEA for a walk and have our dinner at there before we move on to the Clara's concert at 8pm. When we reached there around 7.45pm, we saw a little crowded over there and we guess not so much people to come for the concert, but we are wrong! After 8pm, we saw many people already here and waiting to queue to go inside! Yea we took photos again over there, too excited already hah! Due to the concert don't allowed us to photograph inside and too dark as well, we din't take photo until the concert finished at 9.30pm. Her concert overall was quite good. After that we came out to wait for her autograph on our albums that we just bought before the concert start. After the autograph session finished, we took a photo outside Bentley Auditorium before we went back to home. The next day we went to The One Academy Sunway to pay a visit since we were from TOA also. Before we visit there, we having our lunch at Sushi King which located in Sunway Pyramid. This is the lobby which located at one of the building in basement. This is the Gallery Showcase for the 5 Majors in TOA. Around 5pm, we prepared to sit the Aeroline back to Penang!